This church was built, contrary to the usual rural setting for most Primitive Baptist Churches, in the middle of what was once a booming railroad hub rather than on the outskirts of a town or out in the countryside. Mr. M.T. Lawrence and Stephen Outerbridge, founding members of the Robersonville Primitive Baptist church, were both members of the Kehukee Association, one of the largest congregational associations in Eastern North Carolina. The construction also broke tradition with the single front entrance rather than the double front doors for gender separation. The facility is fifty-four feet by thirty-six feet frame construction. 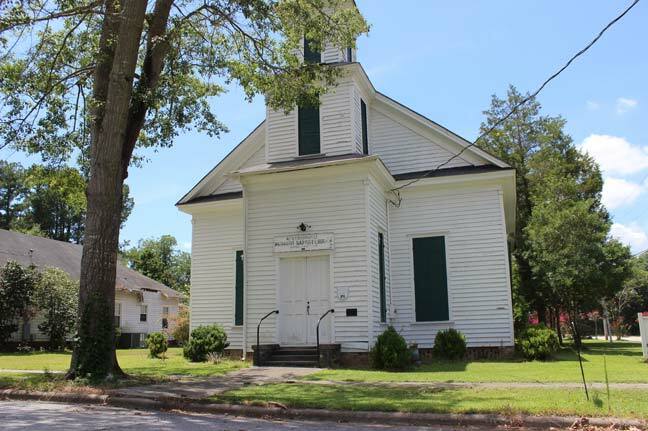 What was unusual for the time is that the design represented a more “worldly” appearance than most of the other Primitive Baptist buildings as seen in the more Colonial Revival rather than the Gothic Revival design. (Note the double section for the bell tower). 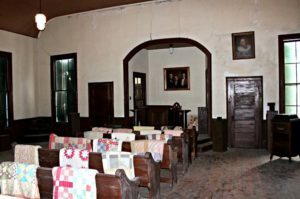 The interior featured fourteen pews, approximately ten feet wide which are lined up from the entrance to the raised preacher’s stand or raised dais. On either side of the preacher’s stand were five-panel doors leading to a hallway with an outside entrance. Back in the 1930s, bathrooms were added, one for the men on the south side and one for the women on the north side. The Gothic Revival building was originally constructed in 1910 as a Primitive Baptist church building for the congregation, founded in 1883. The building was later restored in the 1990s by Dr. Everette James and was, for a while, home to the St. James Place Museum.